Man's second album of 1974 had the unenviable task of competing with the group's highest charting album to date, Rhinos, Winos And Lunatics, released just five months earlier. Unsurprisingly, in that time the band had undergone another line-up change with keyboard player Malcolm Morley jumping ship after the group's first successful American tour. That left the band as a four-piece again with Micky Jones on guitar and vocals, Deke Leonard on guitar, piano and vocals, Ken Whaley on bass and Terry Williams on drums and vocals. Amazingly, after the five-week US tour, the band only had a week off before heading off to Clearwell Castle in Gloucestershire to write the next album, a feat they accomplished in just two weeks! Boy, how times have changed! The album was written and recorded in an atmosphere described by Jones as "Post American blues" with Leonard stating that the group felt somewhat "displaced and after the wide open spaces [of the US] we felt mildly claustrophobic". As a consequence, the album, particularly in the lyrical department, is quite downbeat, with main lyric writer Leonard stating that his mind was elsewhere - "a really morbid alley-way which is full of death, disease and real black images". This is true of opening number, A Hard Way To Die, as if the title was not somewhat of a giveaway! However, musically it is quite a jolly number and opens up the recording in readiness for the string-laden Grasshopper. The first of two ballads, Grasshopper is a gentle and lovely acoustic number with a complete string section providing most of the impetus of the song. Rock And Roll You Out, a song inspired by Leonard's exclusion from a Welsh night club for wearing jeans, is a bluesy number with a pretty standard beat but with the added attraction of some nifty slide guitar work and even a harmonica solo! Another true incident, the theft of Micky's possessions while on holiday in Italy, was the inspiration behind You Don't Like Us. There is a definite air of Badfinger about this track, ironic as those other fabulous Welsh rockers were to support Man on their next UK tour. An energetic guitar and synth introduction starts off Bedtime Bone which has quite a few instrumental passages, mostly because the band objected to Leonard's original lyrics about a chap dying whilst in the arms of a prostitute. Attempts at alternative lyrics were no more positive and so the original words were edited leaving space for a somewhat uninspiring synth solo. The lively One More Chance also hides a rather morbid lyric, but one doesn't notice it behind the delightfully cheery chorus and the twin guitar assault that makes the song a classic example of the Man oeuvre. The second ballad is Rainbow Eyes which also benefits from a string section, although not in as prominent a role as in Grasshopper. A more positive number from the pen of Micky complete with choral vocals on the middle eight, it sounds like a pop song from the late sixties, and although fairly distinct in the Man repertoire it is none-the-less a minor gem of a song. They still manage to slip a death into the lyric though! Last track of the original album is the single Day and Night which, at the time, was a favourite of John Peel's; he even nominated it as single of the week when he reviewed it for Sounds magazine. Peely, as ever, was spot on in his assessment and it is surprising that the group didn't even score a minor hit with the song with it being a catchy ditty an all. 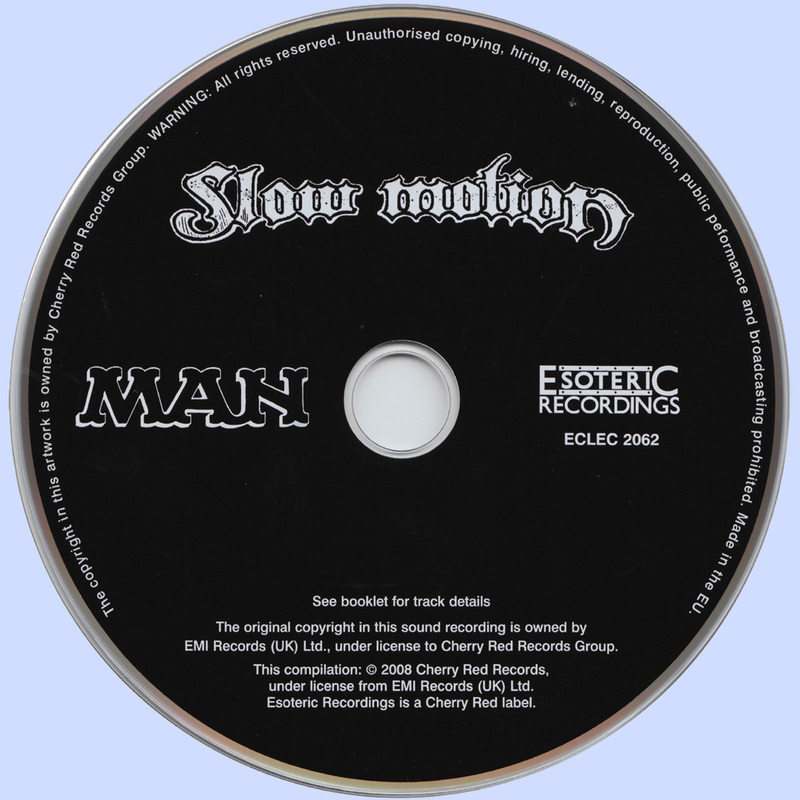 As for all the Esoteric Man re-issues, the CD contains a host of previously unreleased bonus tracks, starting with the first mix of Rock And Roll You Out whose main difference is a saxophone, which although barely discernable in the final mix plays a major part in this initial version, featuring in its own solo and in an interesting trade-off with guitar in the end section. The b-side to the Day And Night single, a live version of A Hard Way To Live is an energetic number which first featured on Deke Leonard's solo Iceberg album. Despite the original having been recorded after Leonard being fired from Man over attitude problems, the rest of Man were quite familiar with the material as several of them had played on the album and the band Leonard formed to promote the album (who were also called Iceberg) had supported Man on one of their UK tours. As if in reposte, the next bonus track is a live rendition of Hard Way To Die which comprehensively shows how the group were able to take a good studio song and ramp it up to another level when on stage. Hard Way To Die is the first of four live tracks taken from a concert recorded in California in April 1975, the second, Somebody's Calling (otherwise known as Someone Is Calling) is a relative rarity having only previously appeared on the 'Rare Man' CD and a couple of live bootlegs. Although less than 3 minutes long, the first high quality release of this number is a great bonus for Man collectors and completists. The final two tracks are the classic Many Are Called, But Few Get Up and another version of A Hard Way To Live. Maybe it would have been better to include another track from this concert instead of the latter track although one can't quibble too much in these matters! The version of Many Are Called... also displays the skill of the band in taking a regularly performed number and rearranging it within the confines of a familiar framework, much in the way that the Grateful Dead were able to do. This explains the popularity of the plethora of live releases, many of which contain similar track listings. 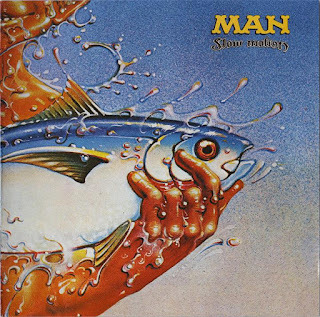 Although not often cited as a pinnacle album in the band's career, that is possibly due to the classic album that came immediately prior to it and the fact that Slow Motion was released so soon after. In addition, the general negative vibes might put some people off. However, all that withstanding, Slow Motion is a worthy addition to any Man collection.